I started this blog as a way to reach out and share my experiences, to allow my patients and my readers to get to know me better, and to write about my ‘adventures of health, fitness, and parenthood’. But it’s morphed into more than that- it’s become my creative outlet, my diary, and my memory bank all rolled into one. This week marks the one-year anniversary of www.drworobec.com. And what a year it’s been. It’s been a year of ups (I Hope You Always) and downs (Farewell, Our Loyal Friend), trials (Memories for Sale) and tribulations (I am a Transplant. And it’s Christmastime), criticism (Yes, I Paint my Son’s Fingernails) and praise (The Art of Humility). From my first post (Lance Armstrong and Me: the Online Experience) to my favorite post (10 Lessons that Dads WILL Teach their Daughters), I have enjoyed sitting down every week and pouring my feelings onto the computer screen. I hope you feel that realness conveyed in my words. I’ve written a lot about nutrition (Food for Thought), Crossfit (This Thing Called ‘The Open’), and running (21.1Kms of Friendship). I’ve written a lot about my children (My 6-month-old Loves Chicken), my parenting style (‘It’s Not Babysitting, It’s Parenting), and the mundane goings-on of my everyday life (Sunday at 3:00). I’ve written a lot about chiropractic (I am a Chiropractor), my patients (I Want to Thank You), and my views on health (“I Don’t Have Time to Exercise”). I’ve been overwhelmed by the response to some (Wear the Dress Socks), and surprised by the lack of response to others (Dear NHL). I’ve cried hard (Break the Silence), I’ve smiled hard (It’s More than a Piano), and I’ve thought hard (Cancer is a Powerful Word). I’ve had a good year. 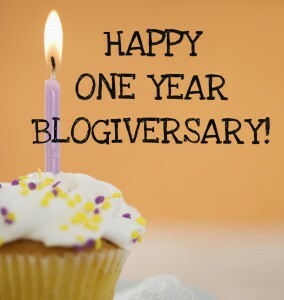 This entry was posted in Opinion and tagged blogiversary, opinion. Bookmark the permalink. Yes, we’ve had a good year also, reading the blogs. I always look forward to opening Tuesday morning’s email to see what you’ve written. I’d be hard pressed to name a favourite – there have been so many excellent ones! Keep up the great writing!